Musix Linux 1.0 R2R5, a 100% free operating system based on Debian GNU/Linux and Knoppix, and meant for artists focused on music production, has been announced a few days ago by the Brazilian music teacher Gilberto Borges. In this version of Musix, Brazilian Portuguese and English have full support, while Italian, Spanish, French, German and many others languages have only partial support. However, the former can be added using Synaptic or apt-get. With this version, developers hope to provide good support for Brazilian users, and to update and improve Musix 1.0 R3 CD and R4 DVD by using the feedback received during these months from various places, such as schools or homes. The first Brazilian version, having being tested for the last six months, generated no report of a major bug in the system. 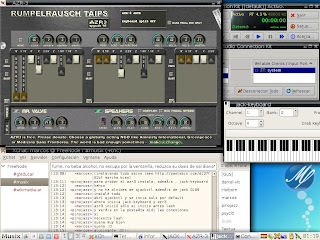 Some packages were added, like Rakarrack (a real-time effects processor for guitarists, which was already on Musix 1.0 R4 DVD) and Partitura (a simple application to make blank score sheets), while others were removed, like a-Mule and Terminator-X, which can be reinstalled at a root terminal. To install Musix 1.0 R2R5 you can download it from here and burn it onto a CD, then reboot. At this stage, you have a fully operational OS running from Live CD, which can be easily installed on the local hard drive, if you so choose.